Renovated Beachfront Penthouse Unit!! Views! Views! Views! Relax at the beach for your next vacation, look no further than the Apollo #1002 island escape! This top floor 1 bed 1 bath condo offers some of the most stunning sunsets from your very own private balcony. 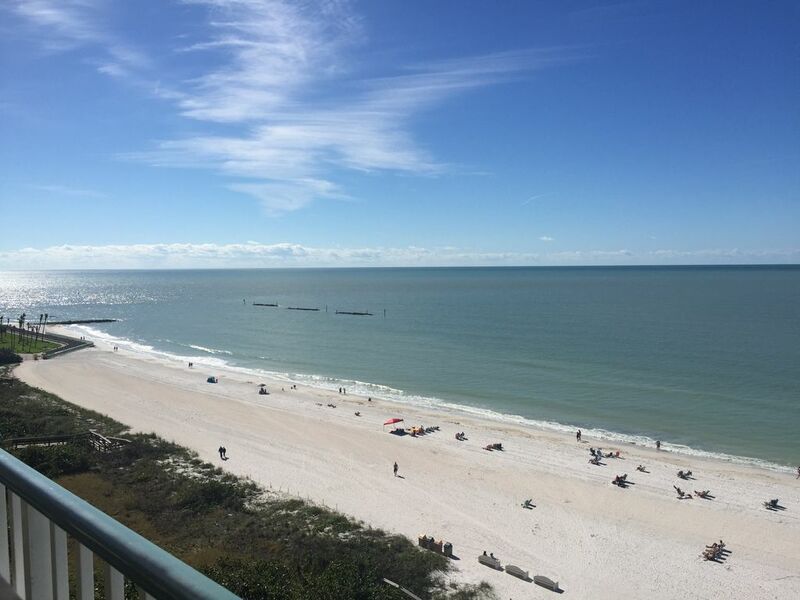 The Apollo Condominium is located on the South tip of Marco Island. The views are absolutely stunning! Enjoy all the amenities the Apollo offers, sauna, fitness room, tennis, spa, heated pool and the popular on-site Sunset Grille! Only a few other buildings on the entire Marco Island beach has a walk-up restaurant/bar, those being the hotels. The Apollo was nominated in 2015 by Trip Advisor, the highly regarded Traveler's Award Certificate of Excellence! This award winning building provides an unreal experience for all guests that visit. Marco Island is the largest of Florida's Ten Thousand Islands, located on the Gulf of Mexico in Southwest Florida. It has been described as Magical, Mystical and Alluring. The attraction is tropical sun-washed white beaches and a casual easy paced life style. Sunshine, frolicking dolphins, and all of the water and sun sports that go with the beaches are available for your pleasure. Free Tennis, Washer and dryer are located on the same floor as unit, Walking distance to the Marriott, Walking distance to Spa and local shops, Walking distance to local restaurants and movie theatre. You just can't beat that view!! Our condo was nice. could use a little better lighting in the bed room and maybe a few more kitchen supplies. A new blender would be nice,Had lots of towels and Beach towels, the beach chairs were not very sturdy and the beach supply closet got cleaned and straightened up by my husband. We loved the condo location. the cook top buttons are very touchy, so it kept shutting off on us till we figured it out. Overall we enjoyed our 2 weeks at the Apollo. Can't say we enjoyed the Sunset grill though. Slow service and basic food. but that has no thing to do with the condo. Front desk were very helpful. LeeBe's Fish Market was our favorite place to eat on the island wish it was closer to the condo! The condo was just as described. Very clean, beautiful sunset views! We had a slight plumbing problem that was resolved within the hour. We can't wait to rent here again. Perfect space with an amazing view. We saw dolphins from the balcony just about every time we looked. Met my daughter here for a long weekend. I love the location of the Apollo. Having the Sunset Grille on site is a real bonus! The pool and hot tub are nice but are closed after dark. view from condo incredible. Sunset from the balcony - very enjoyable! condo has all the basics! We had a fabulous time on Marco Island, weather was beautiful and the condo was in excellent condition. All of the employees that I had contact with were professional and courteous. The pictures on-line for the rental were realistic. If I had to change one thing about my experience it would be the antiquated check in and out system. I had to pick up keys in one area and check in at the condo, usually rentals now-a-days use a key less system and you really do not have to talk to anyone at all. Also using and remembering to bring the enter and exit gate pass was a bit annoying this should be a code entered each time you have to passthrough. I sound like I am complaining but I am not , just suggesting. All in all a great trip and area! I loved the place. Very clean and relaxing. The views were amazing,great unit. It was beautiful. The only thing I would recommend to the owner is to please FIX the venetians Blinds in the living room, they keep falling down and it's very annoying and please put a ceiling fan in the bedroom ceiling. Other wise it was a great vacation and I would rent this unit again and again. E-mail for off season monthly rates.